Caymanians the time is now to DEMONSTRATE IN THE MARCH! If you do not then you will be marched over by oppressive governance and greedy destructive developers knowingly destroying the East End Water Lens, the scenic Sea View Drive, leaving Caymanians taxpayers to pay for the entire infrastructure external to the Mega Quarry. How much sense is there in several ships bringing rocks each week and Mega Quarry shipping out our rocks each week? Madness. Only DUMBOS could support this crazy damaging nonsense. Please circulate the DEMONSTRATION MARCH to your entire email list. If you are a Civil Servant then set up an anonymous email account (on Gmail, Yahoo, etc.) that does not use your real name e.g. anonymous98@gmail.com. Get the word out CAYMAN IS NOT FOR SALE, NO BOBO NO! Hopefully ALL other Civil Servants can take note/comfort in that The Director of DoE has stood tall here and clearly made her views known….and take from that, that ANY and ALL Civil Servants can also ask questions and stand up where matters are of National Importance. I'm not aware of where any CS signs away their Democratic Rights at any point of employment. Those who would like to turn Cayman away from Democracy are counting on us allowing Fear to rule. Democracy requires us ALL to take a stand! Thank you DoE ad CITA and the Marine Consultants. Well presented! Yet Mac Mac is set on entertaining such foolishness as this, and now an Oil Refinery also….just to name two completely destrucive proposals that he is currently entertaining. Now help us save the West Bay road, please. we really will have to march against this, Mr. Miller and Mr. Mclean i think it is time for us to have a protest march to the LA so the people can let Mr. Bush and Mr. Imparato know that if we have to lay down in the middle of the road to put a stop to this dock. Mr. Bush we the people have a say as well not just you and if we are against the dredging in the North Sound, we will be against this one too. 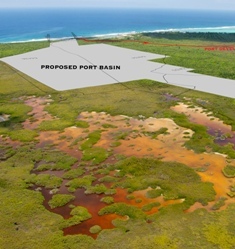 Hopefully this demonstrates that this project is not good for Cayman! If DOE cannot be satisfied then the project needs to be out the window. In all project proposals that might have an impact on our environment the same approach should be taken! "Guilty unless proven innocent" lets give the environment the upper hand for once! The people that own land (in the zone outlined in red), have they all been consulted about this? Why is there a zone that is in red here? What does it mean? what really concerns me is that the general public have been repeatedly mentioning these same detrimental points as these reports have highlighted but yet our premier doesnt seem to understand or care. That the Premier doesn't care? Yes I find that quite believable – he doesn't seem to care much for Cayman, Caymanians or Conservation. Yes we can actually. He's a muppet! 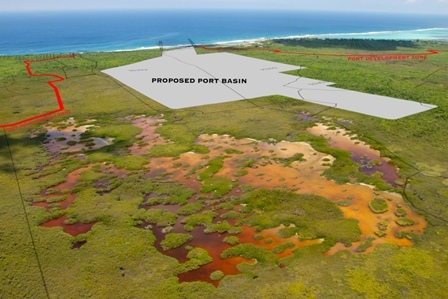 So what else needs to be said so that these people realize that this project is bad for Cayman? All this plus the fact that the people of the Cayman islands themselves don't want it and yet it still might go through CIG should remind EVERYONE that CIG and what is called leadership in Cayman does not work for the people, CITA, DoE, or anyone else but the Civil service tribe. If you want your country back this is who you have to fight for it. Careful though. Because you have been feeding it it is growing larger and getting more hungry every day. Except (a) its not the civil service, not even the Port Authority, who have proposed this and (b) its the civil servants at the DoE, etc., who have released the most recent 'rebutal' to the proposal. Your opinion is about as based on fact as the EIA. Oh that the DoE was the strongest voice in CS. Just think of how bright Caymans future could be. You see what you are looking for. If that gives you comfort good for you. Rest in Peace. "The Cayman Islands Tourism Association, after polling its members last week, said that not only is it not in line with the NTM policy which is widely supported by the tourism industry but the additional trucking fees for a cargo port in East End would significantly increase the cost of doing business. It also noted that the destruction of at least two popular dive sites and damage to at least another one undermine one of the main tourism attractions to this area of the Island. The impact on the water lens and the wide negative international media coverage related to the environmental issues caused by the project are also of concern, CITA said." Surely, Pilar Bush must have mention all of this to her client. Saying saying… we have to be careful who we represent. Trucking Myth: That the seaport would increase cost due to trucking from East End. Extra cost per container is less than $250 to truck from East End. Bigger ships will have lower costs. Even if that is not case each container has between $20,000 and $80,000 worth of product in it. Thus it attracts $4,000 to $20,000 worth of Import Duty on arrival. Extra $250 trucking is totally irrelevant. Do the math. As you can see the larger ships may in fact bring DOWN shipping costs to businesses and consumers. WRONG, it increases profits for the few. Who says larger ships will come? It's the same size island. Big ships are not going to stop in to offload a dozen containers. It makes no sense for transshipment either because it's too little and is surrounded by larger ports that are destinations as well as transshipping points. There is nothing here that even pretends to analyze the economic feasibility of such a port. The first question should be how much port do you need and then proceed from there. It is stupid to start from the premise of let's build as big a port as we can fit on the island and see how that goes. Port of Dreams. "Build it and they will come". LOL. 12: 49 apparently you don't know anything about ships, have you heard of bow trusters, these are power driven propellers in the bow of the ship and on the sides for greater manuverbility. Shipping has come a long way from needing tugs to assiat them in docking. These ships can turn on a dime. Learn the facts don't listen to others, educate yourselves, that is my motto. Never been in business have you. All costs are passed on. Yeah- but who is going to cover the cost (we will) to build the road to truck to GT? Trucking cost not just for the 'truck' but the road it drives on. 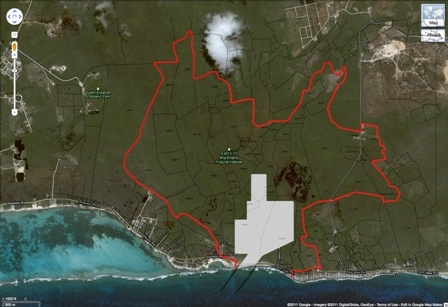 How about the cost of building a new road from Savanah to East End on an island where the population is decreasing and the economy has shrunk by 11%. Currently one truck and one driver can pick up a container and deliver it to the container yard and return to the dock in about 15 to 20 minutes. That means that one truck and driver can do about 24 trips per shift. If coming from East End one truck and driver could do a round trip in 2 hours, best case scenerio. Meaning one truck and driver would only be able to make three trips per day. At current shipping levels that would mean trucks and drivers would have to increase by around 700%. Everyone acknowledges the road would have to be built to handle the increased heavy truck traffic. Where's that money coming from. Joe has said he's not paying for it. How about we stop leeching off the government for everything.In other parts of the world, citezens alike have to pay dearly (taxes)for their infacstructures and services, here we want everthing free. In the real world citezens have to pay a toll for the building and maintinance of their roads, we need to start paying our way, we can't even pay for our garbage collection, our Government had to force payment ,by adding this on to our Importation tax. I can see it now, Caymanians 30 years ago, saying …no we cant put the airport in George Town…it will be be expensive to drive to East end. No we can't put the dock in George Town the trucking will be too expensive. No we can't build this we cant build that, where the hell you think we would be today? Yeah I get your drift, but your drift does not make any sense. There is no need for a port on the otherside of the island. The EE Seaport isn't going to attract transhipment business for the numerous reasons stated in the article. Our population is not growing its shrinking. You make comparisons to the "real world" which is comparing apples to oranges. The places you refer to have populations in the MILLIONS to help pay for large infastructure projects and are not limited by geographical constraints. Your reasoning is like a lower middle class family of four wanting to build a 20,000 square foot 10 bedroom house because its "progress". People do not do maths my friend, they prefer emotions. You are correct. Your post is more about speculation than math. It is not an established fact that larger ships will come. However, we do know as a certainty that local costs will be increased both indirectly and indirectly through infrastructural needs. Who is going to pay to move all of the govt. infrastructure and build the new road? Who is going to pay to maintain the road that would be bombarded with heavy equipment traffic? You are small minded if you think it is merely about $250 trucking. Well if the DoE report doesn't kill this 'project' nothing else will. I am sure that is the plan of DOE! Good thing too. After all they are responsible for preserving our environment.